When I landed at Valparaiso, Indiana, KVPZ, my traditional fuel stop en route to Oshkosh (the FBO gives fuel discounts to #OSH-bound airplanes, too), I started chatting with a friendly elderly man. I mentioned something about his wife, and he said, “No! I’ve never gotten married because I didn’t want to lose my freedom to fly!” Then he looked at the horizon and said, “When I take off from the grass strip on my farm at sunset, I’m really at peace, and I wouldn’t want to lose that.” My mind raced. Would I be as avid a flier today if I had not been encouraged by my family? Maybe not. Some wives forbid their husbands to fly a small airplane, much less ever fly with them. I’m enough of a rebel that I would have no choice but to prove a point if someone forbid me to do something, but more often than not people just want to keep the peace. In my travels, I’ve talked to a number of men and some women who say their spouses, parents or kids won’t fly with them, and I often sense they are wistfully sad about it. One woman I know said she had tried to get her mother to fly with her but was unsuccessful in convincing her. I’ve taken my mother flying, and it meant a lot to me. Is there a way to win friends and influence people, especially those closest to us, when it comes to flying? Fear of flying might be No. 1 when it comes to excuses for people not to fly (and fear of heights and claustrophobia). I may not be the best person to talk about fear of flying. I have a healthy respect for its unforgiving nature, and frankly fear is an emotion I can’t afford. I remember quite well the feeling I had at 6 years old the first time I stepped into the aluminum tube of my dad’s DC-6. I told my mom I had butterflies in my stomach, and she scolded me, “What are you talking about? It’s just an airplane. Nothing to be afraid of!” What she said to me that day changed my emotional connection to flying, and perhaps if she hadn’t said that and had instead encouraged my fear, my attitude could be completely different today. To pilots, flying is amazing, and we want to share, but since not everyone feels that way, it’s important to understand a person’s emotional connection with airplanes. Fear of flying stems from a lot of different things—parental attitudes when we are growing up, societal attitudes (“You fly?! Aren’t you scared?” a question I get a lot), fear of not being in control, or perhaps losing a friend in an accident. It’s easy to understand, because when an airplane crashes, it gets spectacular press compared to a car crash, which is usually no more than a byline. The fear I felt as a 6-year-old probably stemmed from the new and unknown, but because of the way my mother handled it, I never associated airplanes with negative emotions again. I have a small oil painting that I love. When the light changes during the day, the colors in the painting reflect the light and bring out different qualities. The problem with it is that it was given to me by someone who turned out to be duplicitous and untrustworthy, so part of me wants to give it away because it’s a constant reminder of this awful person, but as a painting it’s really superb. I could show it to anybody, and they would just see a painting, but since I have a skewed emotional relationship with it, I have a hard time separating emotion from logic. This analogy helps me understand that some people don’t just see the beautiful lines of a DC-3, for example. Where I see something fun and classic, others might see danger and discomfort. We have to understand the underlying issues in order to change someone’s perception. Is fear of flying irrational? Statistics prove that commercial aviation is very safe. Your chance of getting killed on a commercial airliner, especially one that is not on the EU “Blacklist,” an airline you probably would never fly anyway, is less than one in 11 million. Pretty great odds by any standard, especially when you consider that over 35,000 people die in car accidents and nearly 5,000 people die from work injuries in the U.S. each year. To be honest, general aviation is slightly riskier than commercial aviation, but it would take a lot more than the scope of this article to discuss the reasons for this, including taking into account some of the uses of general aviation such as low-level work including agricultural, pipeline patrol, fire-fighting, etc. Most pilots believe, correctly so, that with a well-trained pilot and good equipment, general aviation is as safe as we make it. You might say, gosh, all I want is some company when I go flying. Do I have to be an armchair therapist? Well, maybe a little. Be sympathetic, at least, but dig deeper if you can. Emotions are never wrong. If you feel your partner has an emotional block about flying with you, discuss it and try to get to the heart of the matter. With any luck, it will be the first step in overcoming their resistance. But it’s not all about fear. People don’t want to fly for other reasons as well, like feeling that flying is boring and uncomfortable, and, you have to admit, it probably is at times. When you have succeeded in convincing your partner to fly with you, make it as pleasant an experience as possible. Try to think like a corporate pilot. Pre-flight the airplane early so they don’t have to stand around and possibly worry; wash and wax the airplane so it shines, and clean it up! Pick up any loose debris on the floor, straighten out the seatbelts. For some reason, people think small airplanes are uncomfortable. Say what? Just because your airplane might look like a tin can with only one door, has no air conditioning and a hard-as-concrete seat? Why not give them an Oregon aero seat cushion to sit on and a noise-canceling Bose headset; then try to fly when it’s cool and not during the hottest and bumpiest part of the day. If reason and logic fail, and you can’t convince the person you love to fly with you, then try bribery. Your partner might not appreciate the flying, but they’ll appreciate a nice lunch, a shopping trip, maybe a vacay to a resort with a runway: Jekyll Island Club Resort, Jekyll Island, Georgia; Grand Geneva Resort & Spa, Lake Geneva, Wisconsin; Roche Harbor Resort, San Juan Islands, Washington; Cibolo Creek Ranch, Marfa, Texas; The Inn at Furnace Creek, Death Valley, California (but only in the winter), and other great places. If a spa vacation isn’t inducement enough, you can always try cash! Seriously, break the ice in a fun way, and your person might want to go flying again. Having a reason to fly makes a big difference for most people. Not everyone wants to just bore holes in the sky. I know I don’t. When I put this topic out there on my Facebook page, several people responded that getting their spouse involved with the local flying community—making friends at their local pilots’ association or club, fly-in breakfasts, volunteering at Young Eagle days—made all the difference to their spouses’ attitudes. They made friends at the airport and found a community in what was an otherwise boring thing for them to do. There are a lot of other things you can do together; for example, I know several couples who volunteer for Pilots N Paws, rescuing animals and flying them to no-kill shelters and foster homes. Having a mission can take your mind off the mechanics of flying and any discomfort, and focus it on doing something useful and rewarding. My friend Bobsie Bostic asked me what I was writing about, and I told her I kept running into men whose wives won’t fly with them, and occasionally women with the same problem with their spouses, and she said, “I know! I feel so badly for them. I tell the guys at my airport that I’ll go with them for lunch if their wives won’t!” Sometimes we want to get in our airplane and just fly to clear our mind and to get away. It’s an awesome feeling to fly solo at sunset, like the gentleman I talked to at KVPZ said. But having someone with you who appreciates the flying like you do can make flying really sweet. I struggle to get my wife to fly with me. It means the world to me to have her by my side and she knows it because I tell her all the time. When I am able to get her to go with me, she grins from ear to ear as soon as we’re accelerating down the runway and lift off, just like me. Her biggest objections are primarily cost (I rent from an US Air Force Aero Club), then the fear of turbulence. We both experienced severe turbulence when flying overseas and she’s scared of something like that occurring again. Lastly, she constantly sees reports of small plane crashes where entire families are wiped out. I address the turbulence by pointing out I don’t want to fly in rough air either, and do everything possible to not fly in it, but that we will most likely encounter something, but nothing severe. Still a lot of trepidation on her part, even though we’ve flown several time together with nary a bump. For the cost objection, I explain, and have shown how much more expensive it would be to own and airplane similar to what I fly, or rent from other clubs (no put down intended for other clubs! you do what you can). Still, a raised eyebrow and frown. Lastly for the plane crashes, I point out that the vast majority (in fact all that I can recall) are due to pilot error, and the best way for me to not have this failure while flying, “is to have you along, hon!”. Sometimes that works, but not always. So if anyone has some more suggestions, I’m all eyes and ears. I had several great laughs alone the way, you are naturally funny like General Yeager !!!! Taking into account another persons fears and their origins is a very kind consideration. I found out over the years of teaching flying that most people leave their fears on the ground, especially when you give them a task. Asking my students and or passengers to look for traffic, hand me the chart or helping me find navigation landmarks makes them feel important crew members. Wow, he/she trusts me, I can be like her/him, calm and composed…. 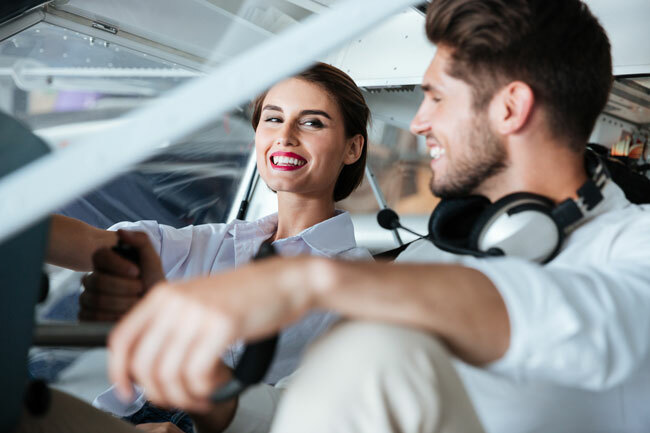 Handing the flight controls to a beginner, after thorough pre- flight briefing and in flight demonstration/ familiarization can capture a future pilots imagination…am I really flying without help ? they wonder, as you pretend not to notice their frequent glances towards your side of the yoke…. Asking them to climb and descend very smoothly by reference to the horizon, then a shallow bank either side is the perfect way for them to attract other clients, they will tell all their friends and family : I flew the airplane all by myself !!!! The destination is all important, my wife doesn’t want to fly just to fly. We did short trips initially and then moved on to longer trips even making it to the Bahamas. Her fear isn’t rational, she doesn’t mind take offs and landing or flying over water. She is fine when thunderstorms are in view. The thing I have to watch is turbulence, especially in clean air and in mountainous areas. My suggestion, keep it simple and don’t put your passengers in uncomfortable situations early. Later, when you know their triggers be sure to avoid them. Finally, remember you can be the source of the problem, if you don’t make flying fun for them or display competence your passengers will pick up on that. Fear of flying because of crash publicly? Well I say we should ban church buses. Those things are dangerous! People are ALWAYS getting killed in those things! Never get in one or let anyone you care about get in one either. If the truth be told, I generally do not like to fly as a passenger with most other pilots in command, unless I am right seat instructor, or the pilot is really good and flies like I do — displays Zen and the Art of Flying — is one with the plane. And the reason, I think, is that as a passenger I am not in control when pilots make “cross-country” traffic patterns for the airport, comes in for a landing at such a shallow angle that they would never make the airport if the engine failed –they leave on margin for error or happenstance.